Carl and Sue kindly hosted our February meeting which took place on what felt like a Spring day! The theme was 'grapes Carl had never tried' and why not! 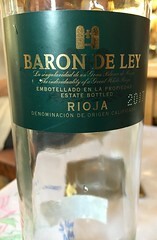 "Irresistible white Rioja: elegant yet rounded - an ideal aperitif. From a multi award-winning estate comes an acclaimed white Rioja. Bursting with ripe citrus and apricot with good weight and texture, this excels with Spanish tapas dishes. A great-value find. " "Elegant aromas of green apple & citrus. 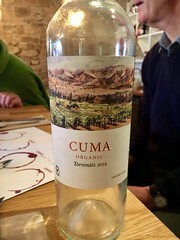 This Tuscan dry white wine has an elegant nose of cut green apple and crisp citrus flavours, alongside soft fruits and a delicious stony minerality, followed by hints of almonds." Again enjoyed by all, and deemed to offer a different flavour from many white wines. "When the winery name is said to mean ‘beautiful garden of God’, you expect something sublime and this wine doesn’t disappoint. 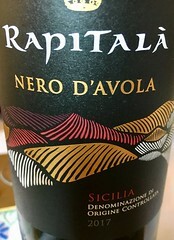 From the rolling hills close to Palermo, Nero d’Avola is Sicily’s most expressive red grape. This seductive wine has juicy plum and cherry fruits, hints of spice and soft gentle tannins. " Again proof that we should always try new things as this red was popular with those who enjoy red AND those who prefer white normally. 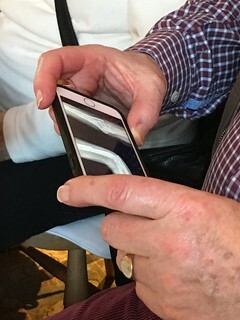 Another very pleasant afternoon when the conversation ranged far beyond wine as usual. The x-rays of the pins in Nick's arm proved an interesting topic certainly! 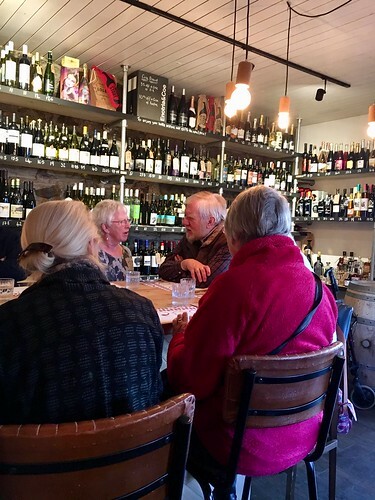 What a great way to spend the last Monday afternoon in January - tasting a fine selection of wines accompanied by tasty olives, bread, meats and cheeses. 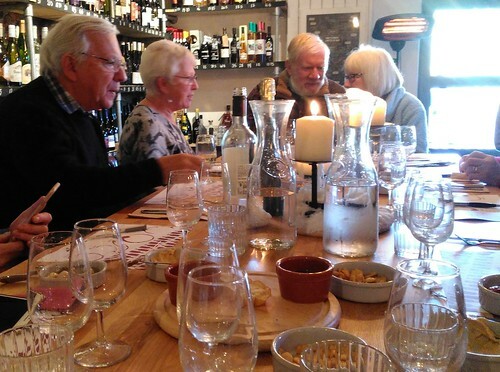 We enjoyed a lovely afternoon at The Wine Store, Charlestown and were transported in comfort via the Lerryn minibus. Pale lemon coloured with green tints, the nose exhibits citrus, pear and floral notes. The palate is lively and fresh with ripe apple and citrus peel and a clean and refreshing finish. A great aperitif and also works well with shellfish. 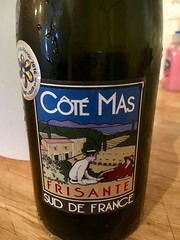 This Frissante sparkling wine is made using the Charmat method. This is where the second fermentation takes place in a sealed tank with sufficient yeast and sugar to produce 2 bar of pressure in the wine. It is then bottled under a champagne cork and is deliciously sparkling! A blend of 55% Piquepoul and 45% Chardonnay. A totally organic wine with a zesty lime and white grapefruit taste. Honeysuckle and peach stone give a warmer background flavour. Pairing well with stronger tasting dishes such as strong cheeses, spicy curries or smoked sausages. With very little human interference this grape grows naturally in the cool night air and warm days. With it’s hint of Jasmine and Rose petals you could easily be transported to Argentina as you drink. An Alsace benchmark from the famous house of Trimbach in Ribeauvillé. Ripe and fruity in the fine 2015 vintage, but with a fine backbone of acidity and wonderful appetising freshness too. A light and delicate red wine, with complex flavours of banana and bubblegum notes. This prompted reminiscences of Beaujolais Nouveau tastings in Kent and London. In general we felt this was a good example compared to some of our memories! Gran Cerdo Tempranillo Gonzalo Grijalba, best value natural red on the market! 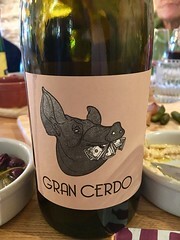 Gran Cerdo is all about great natural wine with whole bunch fermentation, light filtration, no stabilisation and minimal sulphur. The juicy elements of Tempranillo shine through with no dirty oak to mask the charm of this little natural wine giving phenomenal value. The winemaker, Gonzalo Gonzalo is a legend (and not just for his name) because he has proved that you can make a fantastic biodynamic Tempranillo at an affordable price. 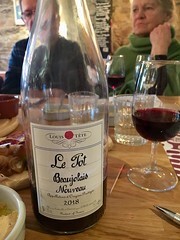 The nose and flavours are an intoxicating combination of red and dark berries, faint lavender (or violets) and a slightly earthy edge. The herbaceous flavours gives the wine a slight green finish with a little spice, while the tannin and acidity cry out for some red meat. As ever the jury was split over our favourite but we all enjoyed the varied tasting which Gina at The Wine Store had put on for us. Bring on the rest of 2019! Our adventures during 2018 may be followed on this page.